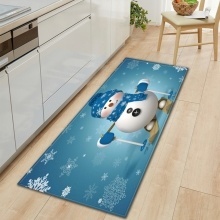 Christmas style decor carpet, great decoration for Christmas festival! 100% Brand new and good quality. This carpet is perfect for home to solve slip problem, mainly at kitchen, hallway, bathroom, balcony, living room, bedroom, etc. Made of good quality material, soft and comfortable, non-toxic, odorless and not moldy. Suitable for kitchen, hallway, bathroom, balcony, living room, bedroom, etc. With good non-slip function, the bottom is non-slip and wear resistant. Can be directly washed by machine or hands, easy to clean, not easy to fade. Fine workmanship, great decoration for Christmas festival!